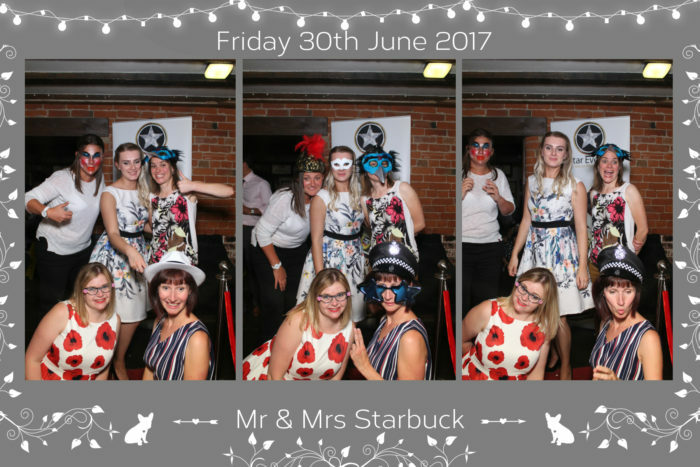 On 30th June 2017 Star Eventz had the absolute pleasure of providing our Silver 3 hour Magic Mirror Booth package to the wonderful Christie & Ben at the very beautiful Donnington Park Farm House Hotel, a stunning building with a history that spans over 400 years old in Castle Donnington, Derbyshire. We were very excited to be present at their wedding in such a lovely location and had been looking forward to it since Ben and Christie first contacted us back in March to ask if we could provide the Magic Mirror for their special day. We spoke on several occasions before the event to discuss any specific features that were needed on the day and this included several bespoke template options and designs. They decided on a grey theme for their magic mirror booth photo template and we decided to incorporate some personal touches into the template for their special day including some French bull-dogs. 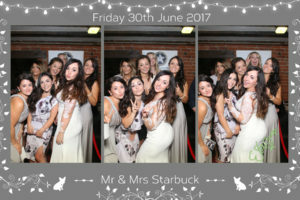 When the day finally came and we arrived we couldn’t wait to get to the venue and get the Magic Mirror Photo Booth set up ready to entertain the Bride and Groom and their guests. 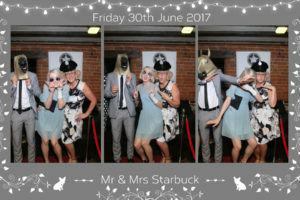 The venue was decorated beautifully for Ben & Christie’s Wedding, with a very modern grey touch which we also included in our bespoke photo booth template for them. Everything had been thought out very well and the venue looked truly amazing, there were many wedding guests present including friends and family of the bride and groom. Our set-up went smoothly and before we knew it the Magic Mirror was ready and waiting for its first guest to come and get involved. We had discussed the exact placement of the Magic Mirror previous to the wedding to ensure that it would be in a good spot where guests would see it and have enough space to benefit from all of it’s many features so we were well prepared before we had arrived, ensuring maximum Magic Mirror fun! Once the Magic Mirror was in in place it started to attract plenty of attention from onlooking guests who wanted to see what the excitement was about. From the moment the booth was switched to the moment we finished there were crowds of guests enjoying it throughout the night, coming up to the mirror and taking photos and laughing at the cheeky animations and props! We also added the red carpet and rails to the Selfie Mirror Booth for the first time at an event and this really did prove popular and added an extra dimension to the Mirror. 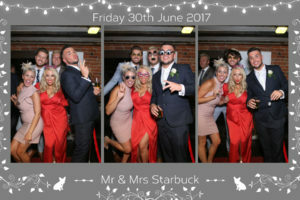 Ben and Christie’s package included sign-able photos from the mirror booth and this was also very popular, their guests loved signing their photographs so this also proved to be popular at their wedding. The wedding itself was a beautiful day and evening, Ben and Christie had a fantastic wedding singer who we very much enjoyed and everyone was having a great time. We were very happy to be there and be part of such a lovely and special day. The setting was very picturesque and the food was phenomenal, they had a whole hog roast for their wedding guests to enjoy which was delicious! Ben & Christie were jetting off on their honeymoon to the beautiful Caribbean island of Aruba after their special day and we wish them a fantastic time and many congratulations on their big day! All in all it was an absolute pleasure being a part of this special day Ben & Christie’s friends and family were such lovely people to deal with and they were all fully engaged with the Magic Mirror. It was a fabulous night at a fantastic venue and we hope to see everyone again.